Breaking Bad has had its fair share of breakthroughs and revelations, but none so big as this. Plus, leave it to the writers to reveal it in such a comical and brilliant manner. However, before I move on to the end of the episode we must glide over the rest of it. Gliding Over All began on a sombre note in the aftermath of Mike’s death. In the past Walt may have killed some people that he was close to, but none so close as Mike. Mike was a trustworthy ally, and stuck by him despite everything he has put him in. And yet, now he is just amongst the ever growing amount of people Walt has had to place in a barrel, which makes Mike seem all together insignificant in the scheme of things. Mike may not have been a pawn, like the others. Rather, he was a knight, but in the game of chess even the knight must do whatever he can to protect the king- even if that means sacrificing their life. Now that Mike has been taken out of the picture, Walt moved to his next plan- getting rid of Mike’s men in prison. The whole prison montage was absolutely horrifying and brutal. I mean within the span of two minutes every one of Mike’s men were dead, some in some pretty messy ways. And of course what does Walt do? Stare at his watch and count down, once again keeping his hands clean. The remainder of the episode was dedicated to building up some future plot points. Although I believed her life to be in danger since the first episode, Lydia has come to be an asset to Walter and quite the strategist as well. Walt has already conquered New Mexico, as we have progressively seen throughout these last four seasons, and so when Lydia suggest expanding outwards towards Europe it got me a little frightened. Walt has barely been able to keep his head on his shoulder dealing with the cartel, along with the D.E.A and others wanting him dead, and so expansion seemed illogical. 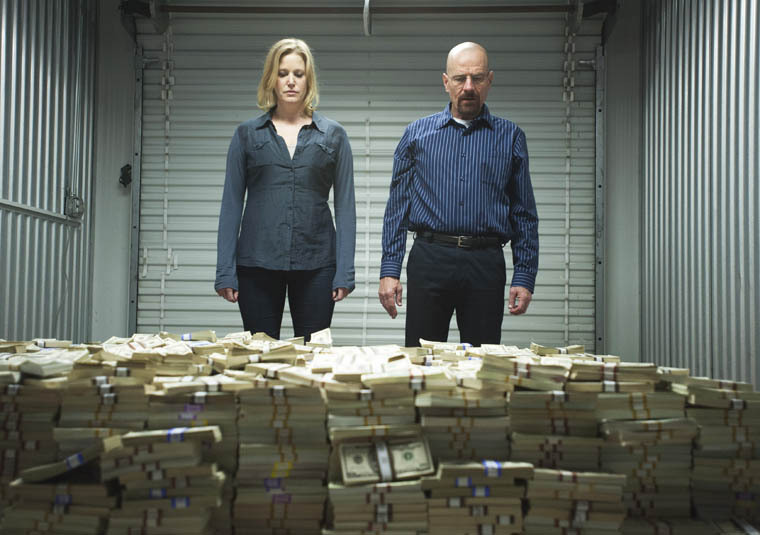 This was further proved after Skyler brought Walt to a storage center to show him all the money she can no longer launder. This was a brilliant scene, showing how greedy and self absorbed Walter has become since the beginning. “How much is enough? How big does the pile have to be?” Skyler asks Walter. Skyler as of late has often been the one character to best summarise my opinions on Walt, and this further proved. Walt has gone above and beyond his original intentions and now it is time to get out- which is what he does. I really enjoy how the writers of this show often reveal big events in such a diminutive manner, and this was one of them. Walt simply walking up to Skyler as she does dishes and muttering “Im out,” gave me the shivers. After all this time and hardship, Walter has finally had enough and wants to begin anew with his family and even some old friends. Walt’s ‘final’ meeting with Jesse was heartwarming, at least at first. As they reminisced about the past and all the stupidity that occurred before the violence, it made me realise just how good a duo these two were. However, the kicker came at the end for as Walt leaves he utters “I left something for you”. And he certainly did. I am not sure if this was a final way for Walt to tempt Jesse, or if he was being sincere, but the sheer amount of money, offset by the gun Jesse throws away had me wondering- was the gun meant for Walt, or for himself. Jesse has been manipulated time and again by Walt and this scene made me wonder who is truly more reliant on the meth business. All of these diminutive closing plot points- Mike, Jesse, Skyler and the money- all led to what I have been waiting for since the beginning- Hank tying everything together. Let’s be honest, Hank had to figure it all out at some point; he is just too smart of a guy. Yet he has always seemed to glide over, as it were, all the clues and hints in which have been placed in front of him. What got me though, was in the manner in which the writers choose to reveal it. If I was not so shocked I would have been laughing at the fact that Hank figured out the mystery of Heisenberg whilst on the crapper reading Gale’s confiscated book of poems by Walt Whitman. Just to further push the point it was great that they showed that scene in which Hank is asking Walt what the W.W in the book could stand for, suggesting Walter White only for Walt to look at him shocked and say “You got me”. I really enjoyed that scene from last season, for at that point I believe Walter truly wanted out but could not. However, now that he is officially out it seems that this time he will be pushed forced back in by a force greater than his own. Breaking Bad has continuously impressed me over the years and this was no exception. So far this season has blown me out of the water, easily becoming my favorite season thus far. It will be interesting to see how it all ends next summer; whether it is Hank to take Walt down or perhaps some of his supposed allies, or if he will get away free and live the life he has always wanted to live. However it is a fair assumption to say that there will be many more deaths to be sung about- perhaps even the king’s himself.